Happy Thanksgiving!!! I have SO much to be thankful for this year, including all of you wonderful people! Today's post is my second Paint All The Nails link up and I think it will result in some really amazing manis like the last one did (view it here)! When the theme for this month was chosen I decided to cheat a little and use a mani that I hadn't posted yet. It's not as ambitious as I might have aimed for, but not having the stress was worth it. Happy Monday everyone! I have some super simple, yet oh so seasonally appropriate nail art for you today. I used a couple untrieds for this mani- Barry M Watermelon and Chili- that my mom brought back from London for me earlier this year. I asked her to get me some Barry M but didn't tell her which colors and those were the two she chose. They're not in my usual taste as colors go, but I really liked them once I tried them on! They go together so well too. I have a quickie post for you today. Here is a swatch of piCture pOlish Whimsy that has been sitting in my files for months now. Time to break it out! One thing that I love about this polish is that it's totally wearable in every season! Don't you think it would look great with some Winter themed nail art? 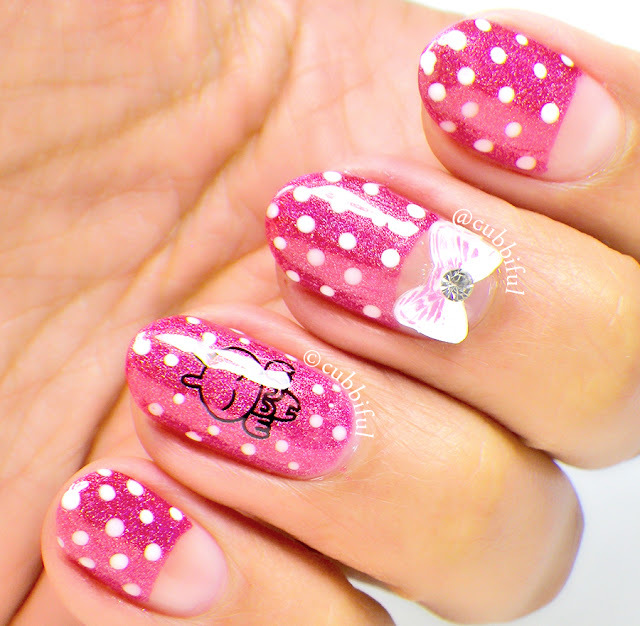 Once again I have here some nail art that I loved wearing, but struggled photographing. One day I will master the camera! You know, when I have time for that... Anyway, this was super colorful and sparkly, but I couldn't capture it properly. I think you can still get the gist of it though. What do you think? How are you all this fine Monday? Most everyone in my household is sick right now. 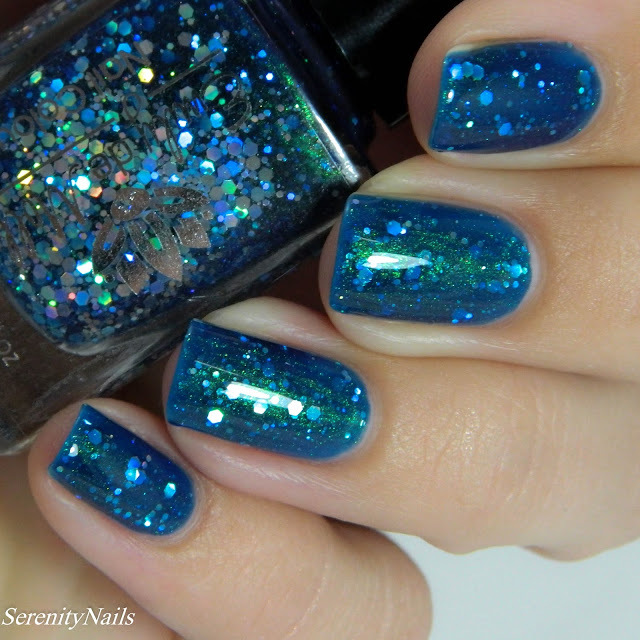 So what better time to post this bright and sparkly rainbow mani? I did this about three weeks ago, it's about time I share it! I am so excited to be here on Emily’s blog today to share a little bit of something with you. But first, of course, let me introduce myself. I am Christine and I run a little blog out of Australia called Serenity Nails. Because I was completely unorganized I am sharing a simple swatch of a polish I picked up recently and some easy stamping I did with it. If you know me, you might know I’ve been on a little Emily de Molly kick lately. Emily de Molly is based out of Australia and produces stunning selections each month! First off I have swatches of the polish that stars in this mani. This is called The Glaring and was released back in September.